When it comes to the essential accessories for bikers, chances helmets, boots and leather jackets are counted firstly. However, wallet also plays a vital part, too. 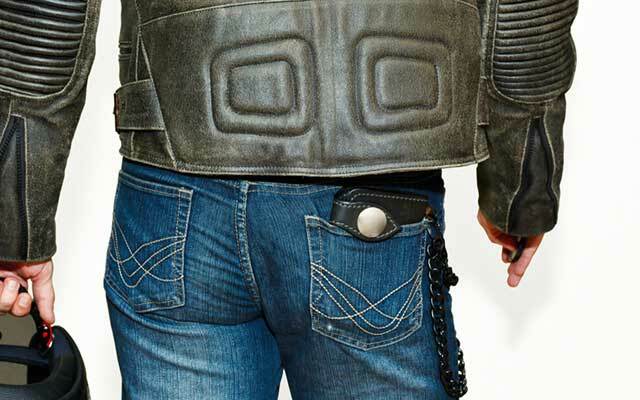 With bikers, you should even look for those wallets with extra protection. 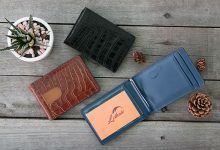 For those who are seeking the best biker wallets to keep your cards, coins, and cash safely as well as a subtle piece to nail your style, look no further than this collection. Here, I’ll give you 9 best options that either I have experienced on my own or spent hours for researching. Now, let’s dive into it! 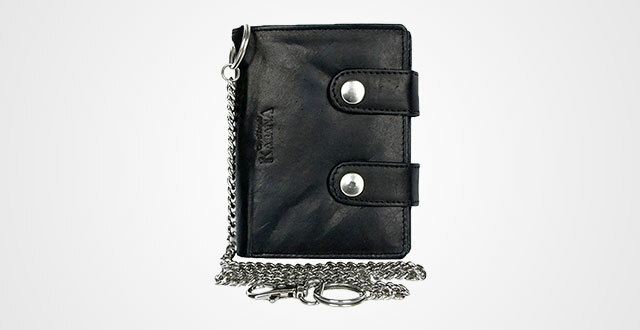 This black genuine leather German-designed wallet from Kabana is worth an item of “One to rock, one to stock”. This is a perfect compromise of functionality and style. It’s a trifold wallet featuring a trifold silhouette with a flip aside in which you can put up either your ID card or some photos. Besides, there is a flap pocket on the right, one more flip in the middle including three card slots and 1 ID window. Underneath is another ID window. Those flips are kept in place by a magnetic strap. Moreover, there is a zippered pocket and a full-length compartment for cash on the top. Such a smart-designed wallet! It’s not only spacious but also well-organized to keep your stuff safely, comfortably and neatly. There are two snap buttons on the outsides to keep your wallet always shut when not in need, as well. You’ll never go wrong with Marshal. Their products are invested carefully and subtly to the smallest details. Meanwhile its genuine leather is no joke, totally I think it’s built to last. 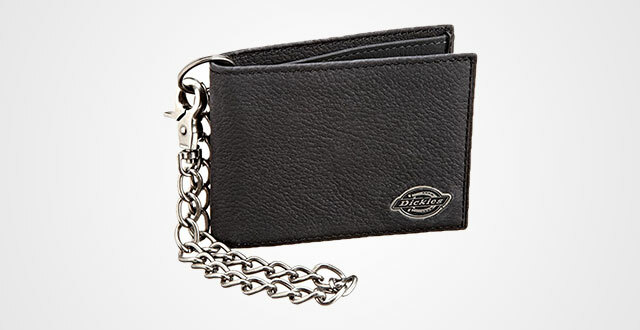 Back to this leather biker wallets with chain, again, Marshal didn’t disappoint me. And truth to say, might this be the only wallet in this collection that satisfies my taste. Very thick, heavy and powerful that it will perfectly nail up my style as well as secure my wallet. Its sturdiness is also shown up through two snap buttons. It’s big, well-operated and good-looking. 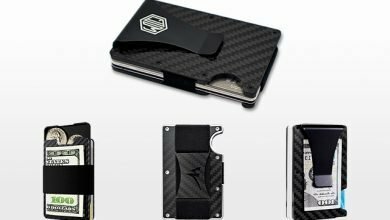 This is actually a trifold, but don’t fret, its dimensions are very slim and compact to enable to fit any pocket without bulk, roughly 4.4 x 3.8 x 2 inches and come up with moderate weigh. In terms of interior, there’s nothing so special but a small detail – the slash-designed of the right card slot for quick access. In general, this is one of the best biker wallets in mid-price range that I highly recommend to you. Truth to say, this Fantastic Zone leaves a lot of good impression on me. Not only for its high-quality soft, smooth leather texture, but also its creative handmade leather woven rope as well as the way it closes the wallet. The overall look of this handmade leather biker wallets is very simple yet elegant and nicely vintage. At first, I thought that this leather chain would be difficult to hook into my belt or backpack. However, its pliable texture has killed my concern. The chain works better than expected. 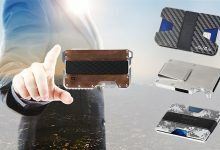 On top of that, its inner construction is spacious and streamline that not only you can put up 6-7 cards and a couple of cash, but this wallet also fits up your iPhone. There are three full-length compartments, two open and one zippered for the best customization. From that point, you can comfortably accommodate your world inside this wonderful piece. And now, I’m so excited to tell you about one of my favorite brands. This is the brand that makes top cool-design accessories that I’m pretty sure bikers you will love. And it’s no other than Harley Davidson! 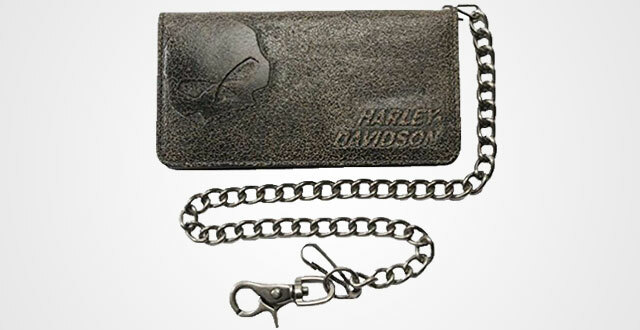 I really like this biker wallet chain as its leather texture is very unique – the Black & Tan distressed genuine leather that when touching, you will feel a distinct softness, toughness and comfort. On the frontside, it has an embossed brand name and a Debossed and buffed Willie G Skull logo. It’s very characteristic and also functional. Going inside, there are 11 card slots (including 1 ID window) and 2 hidden full-length pockets. With this Harley Davidson, you can accommodate up to 10+ cards and 10-15 bills/receipts/tickets, whatever you need without bulk. On the other hand, there are 2 button straps on each corner to make sure that your wallet will keep shut when not in need, providing extra closure and security. In terms of the chain, it is a silver-tone 19” chain with lobster claw clip so you can easily hook to anywhere, your belt, your pocket, your backpack, etc. This Carroll Leather is the next option that I’d like to recommend to you. 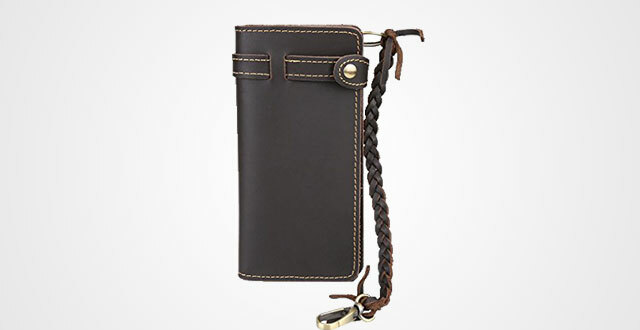 Something I really like about this product is that it’s a USA-made wallet and worth the price. Feature 5 inner pockets, I personally think it’s moderate enough for a great organization, capacity and keeping a slim silhouette. It’s perfect for those who travel on the light side. Help to keep my bills straight nicely and fit ideally with my left pocket based on its chain design. If you are curious about its material, don’t think that it’s poor quality with hard and look-alike cheap leather. I used to have the same thought, but right when I received and touched it, that was a huge mistake. The texture is truly soft, pliable and comfortable. It’s durable, as well. 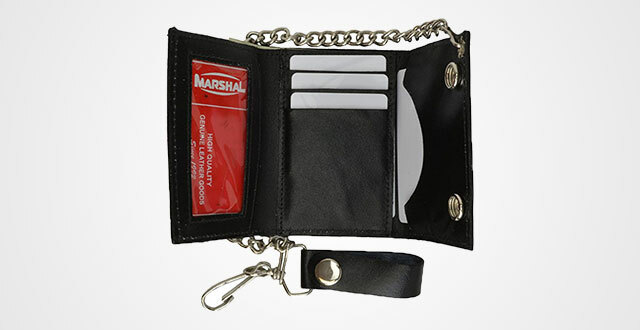 So, if you are die-hard black color fan who is looking for a durable and stylish biker wallet, look no further than this one. 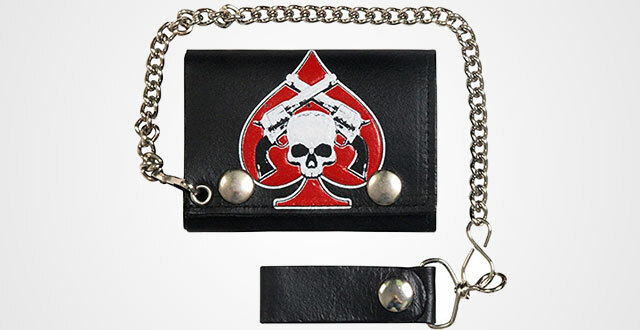 Next up in here is one of my favorite graphic biker purses with skull ad pistol images from Hot Leather. This is a good print that you can easily find out the huge difference between it and the other low-quality printed wallets when touching. It’s absolutely not something that can easily wear and tear just after a couple of months, I can swear it. The print matches perfectly to the silver-tone hardware, creating a badass and cool look. Figured as a short bifold wallet so that its measurements are quite compact with only 8.6 x 3 x 1.3 inches. There is also a long chain plus a belt loop snap to easily connect it with your belt, pockets or backpacks. But I myself think that this chain is a little short for me. Luckily, it’s detachable so that I can replace for a longer one. Actually, this wallet doesn’t cost much and my plan when buying it is to use, hand-wash and beat it up instead of really trying to take care and maintain it. Thus, in a couple of years this will become vintage. I think with such nice print, after a few years, it might fade a little and the wallet itself may get some tear. Perfect to nail a badass biker look, huh? So, if you have the same plan as me, don’t hesitate to pick it! However, if you can’t wait until your wallet become vintage, let just consider this rustic brown (again) from Hot Leathers. Using the Distressed Brown Leather, its outer performance will perfectly fit up any vintage outfits to emphasize your masculine, mature and coolness. Talking about its functions, I think its construction is pretty large and well-organized to manage your stuff safely, neatly whereas keep its slim profile to stay in your pocket. More details, it has two open full-length compartments and 1 zippered pocket. 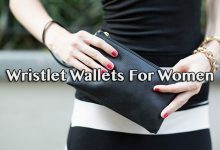 This is one of the best biker wallets that is secured by a heavy snap so that you can feel worry free about your stuff falling out from the wallet accidentally. 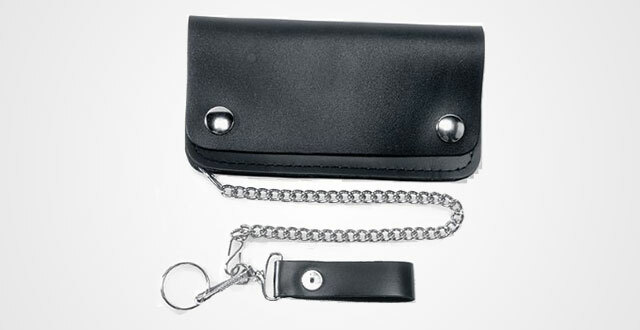 For extra protection, there is also a removable chain with belt loop to hook into either your belt or backpack easily. Please take notice that it doesn’t have inner lining. 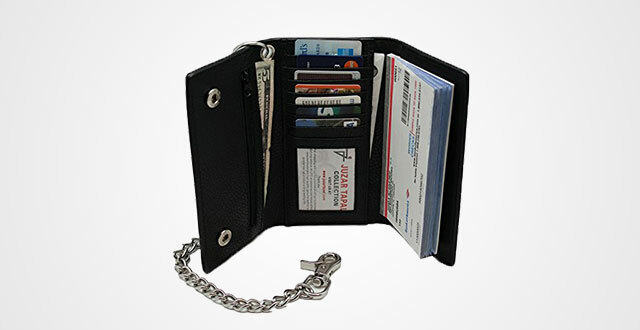 Truth to say, this is one of the top-quality leather chain wallet for bikers that I’ve ever known. I really like its full-black design as well as the silver-tone heavy chain. 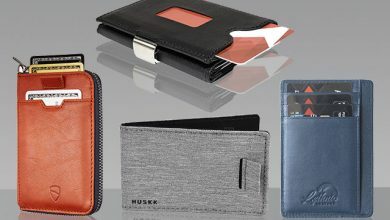 Feeling the material on this wallet, oh my Gosh, I must say this is the reason why Juzar Tapal Collection are known for making the best quality leather products on the market. Its surface still keeps the natural wrinkles of the animal and also its soft and comfortable feeling touch. This product is pretty heavy. The wallet itself might weigh roughly 9 ounces, while its measurements are 7.25 x 0.5 x 4.0 inches. From that point, it gives a truly firm hand-feel as well as a reliable durability. 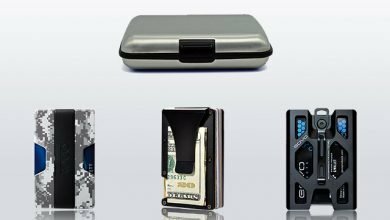 In terms of capacity, as figured as a trifold, this wallet offers quite large storage and great organization with 17 card slots, 1 ID window with thumb strap, 3 slips and 1 zip-around pocket. You can customize the use of these three full-length hidden slips either for different kinds of currencies or receipts and documents. Besides, its zippered pocket is spacious enough to keep up 10-12 coins without bulk. 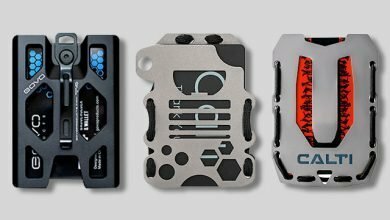 If you read my article written about the best chain wallets, you will know that I’ve already mentioned to this brand. It’s a highly-recommended wallet for any bikers. 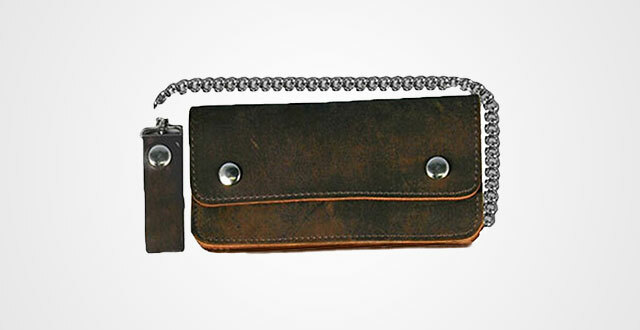 Made out of 100% genuine leather, this wallet is sturdy enough to bear loads and weather. Plus, if taking a closer look, you’ll see how well-made its stitching and the strong threads to deliver a great durability and longevity. Besides, it also adds a layer of manmade lining to reduce friction between your belongings and the leather texture. Did I tell you how much I like its small brand logo on the frontside? Look very subtle and elegant at all. 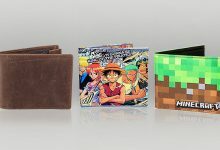 Another good thing is this wallet including a very nice gift box so that you can make use of it as a present. 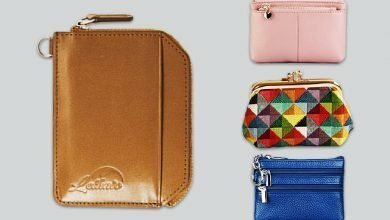 You have just glance through my collection of best biker wallets, have you found the right one yet? Kindly let me know and if you find this article is helpful, you can support me by clicking on the links provided. Thanks!